Originally, the term “full-grain leather” meant a type of leather crafted from the hides of wild horses, goats, lambs, deer or calves. Today, the term is more commonly used for rough leather, whose grain characteristics have been preserved. Nubuck leather is one of the most elegant types of leather and is crafted from more sturdy cow or calfskins, partially buffed on the outside. The care of nubuck leather is simple, but very important. A suede cleaner is the best choice for the special needs of nubuck leather. If you wear you nubuck shoes on a dry day, a simple brushing with a crepe rubber brush, will easily handle any dirt or dust, which has accumulated on the upper. But if your footwear has had to deal with rainy or muddy conditions, then a specialised suede cleaner is recommended. 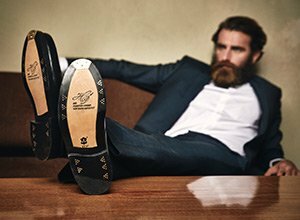 Due to its structured nature and open pores, nubuck leather can quickly become dirty and absorb liquids. That also means using a suede cleaner from time to time is a good idea, and should protect your nubuck upper from dirt, whilst increasing its water-resistance. Of course, completely water proofing the upper is impossible, because leather is a natural product and has to breath. But the nubuck cleaner will build the foundation to protecting your suede and keep your favourite full-grain leather shoes looking good for years to come. Apply the suede cleaner straight to the upper using the bottle’s built-in sponge. Then, using a damp, rather than wet, sponge, scrub the leather upper fully with the suede cleaner. Let the shoe dry for a couple of minutes, before using a suede brush lift the shoe’s nap. You can also use a rubber eraser to remove any waxy spots from the upper. If you find your the leather turning grey with the wear, you are simply experiencing a build up of dust. With regular brushing and occasional use of out suede cleaner, you should be able to keep your nubuck footwear looking pristine. 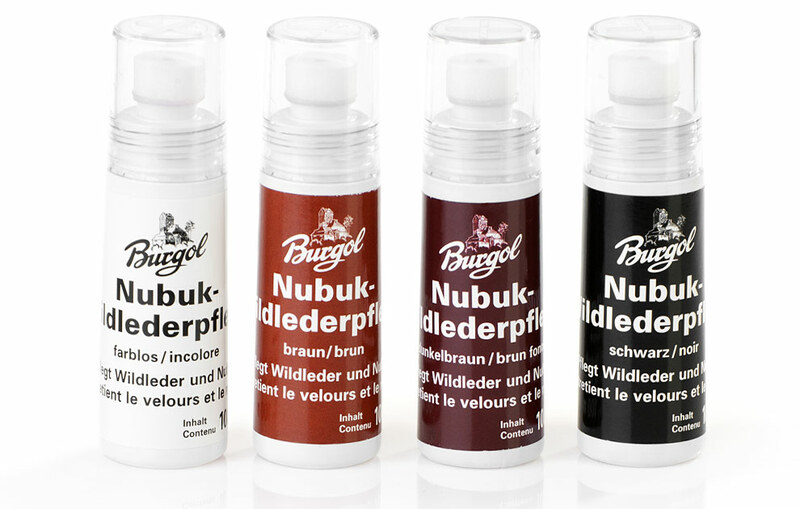 Our suede cleaner is available in a 100ml bottle in the colours light brown, middle brown, dark brown, grey, black, red, blue, green and colourless.